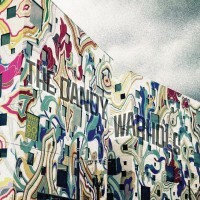 Why You So Crazy is The Dandy Warhol’s 10th studio album arriving on the 25th anniversary of the band. Brimming with catchy melodies and that trademark Dandy's drawl, they run through a sturdy and reliably brilliant distillation of country, psych and anthemic indie to great effect, swinging effortlessly through genres like a knife through butter. A wry look at life through a lens only the Dandy Warhols could provide. Barry says: Perfectly epitomising the Dandy's warmingly obtuse creative output, 'Why You So Crazy' swings easily from shadowy synth-pop ('Terraform') through classic angular Dandies pop ('Thee Elegant Bum') and hazy west-coast pop ('Small Town Girls') with grace and skill. Lovely stuff.